You’ve seen the devastating reports of animals mistaking plastic for nutritious food. The news from the Pacific Islands about the Albatross is heart-rending. You know plastic does not break down for a bazillion years and turtles and birds try to eat it. Please, please, please buy the stupid bag at the grocery or recycle the paper bags or use all the swag you get at conferences. For heavens sake, if you cannot afford cloth bags, let me know I have dozens in my car at all times. 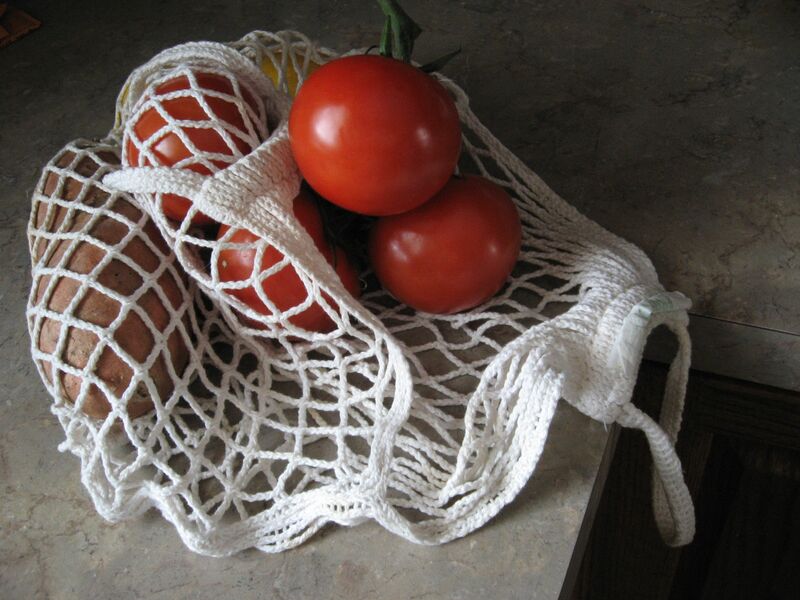 I have been using string bags since my hippie-dippie days. They hold more than plastic and you can throw them in the washing machine. I know I’m preaching to the choir, but if you know someone who is still using plastic; try to influence them. Can we talk about gulls for a moment? I know some birders eschew them, won’t even look at them, call them names like sea rats, G-U-11s, but, truth be told, …shhhh…I sorta like them. Maybe it’s because growing up in the flat land, we didn’t have any. Or they are a visual reminder of the sea. I like their brashness, their insistence, their laugh, their size. Yes, they are frustratingly confusing. 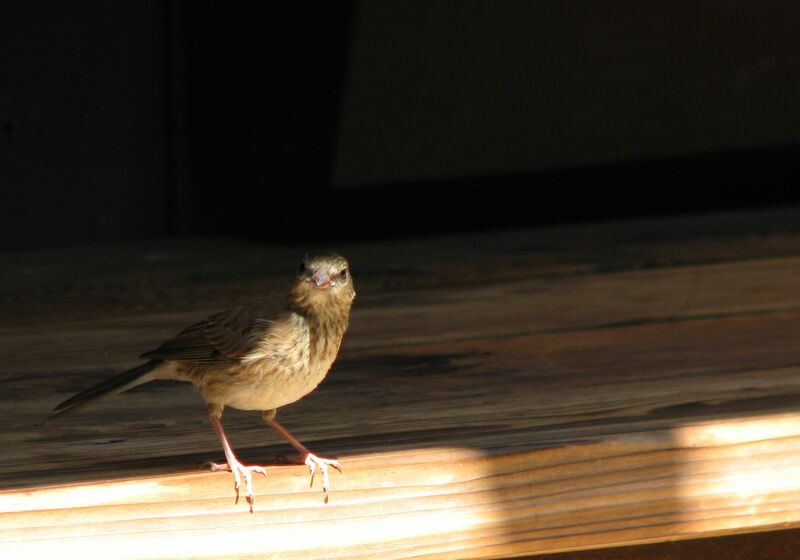 Yes, they have a several year maturity rate so there are lots of in-between plumage variations. Yes, they loaf around garbage dumps and shopping center parking lots, the tops of lamp posts on the Tappan Zee Bridge and oddly enough even at the beach. I am by no means an expert in picking out the juveniles but the adults are not that difficult. With closed eyes the call of a Laughing Gull always and forever will remind of the Jersey Shore. My favorite gull (is it terrible having favorites?) 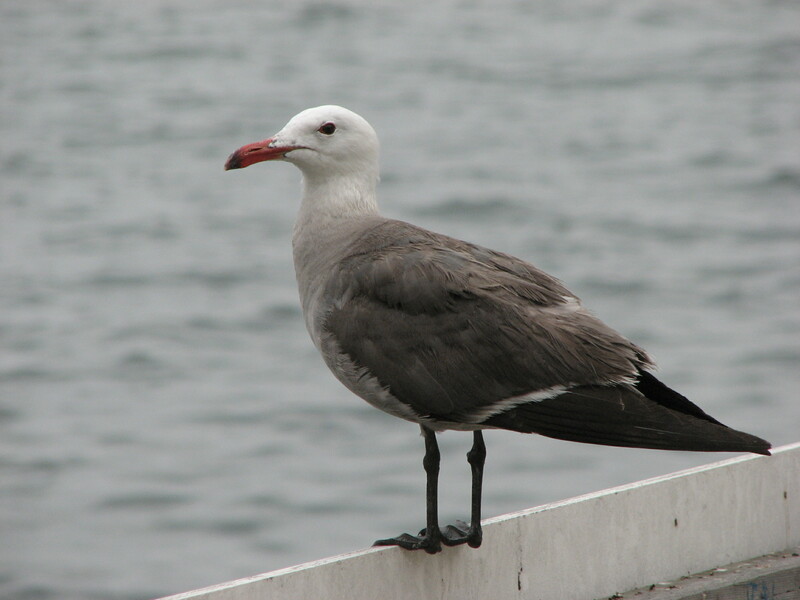 is the Heermann’s Gull from California. I love the soft ombré of their fashionable plumage, going from white through shades of gray, ending with tidy black stockings. And the red beak, what a color, as red as the best lipstick. I think they are absolutely the most beautiful. I was sitting in the back of the conference room with my laptop plugged into the wall, when a young woman put her camera down next to me and sat down. We exchanged smiles and idle conversation. I asked her how she was enjoying BlogHer and she told me about her project. When she asked me about my blog, I explained that I had 4; 2 for work and 2 personal ones–a life blog and a birdwatching blog. Skipping over the other blogs (I think the whole pregnancy thing was freaking her out and being over 30, my life must be incredibly boring), she started asking me about birds. I told her that I had been in San Diego before coming to San Francisco and that I got 3 life birds. Not being a birder, I did not expect her to understand about life birds; but she had no idea that the birds in east were different from those in the west. Floundering for an example that she could relate to, I finally hit upon the Cardinal. I assured her that the Cardinal was very real and fairly easy to see. How do I get involved in these conversations? That is twice in only a few days that young people have had no idea of the birdy world around them. I am concerned for the next generation and what this may mean for conservation. 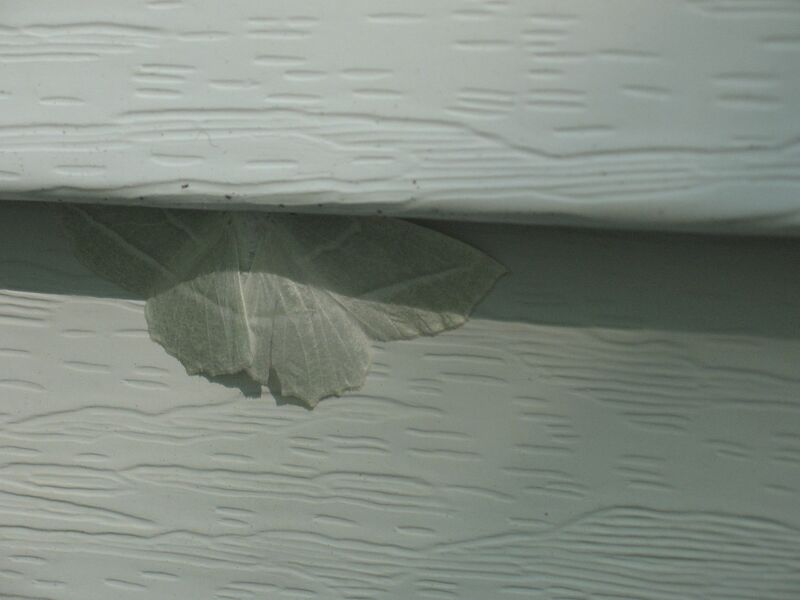 Out of the corner of my eye, I happened to see the flash of white on wings. 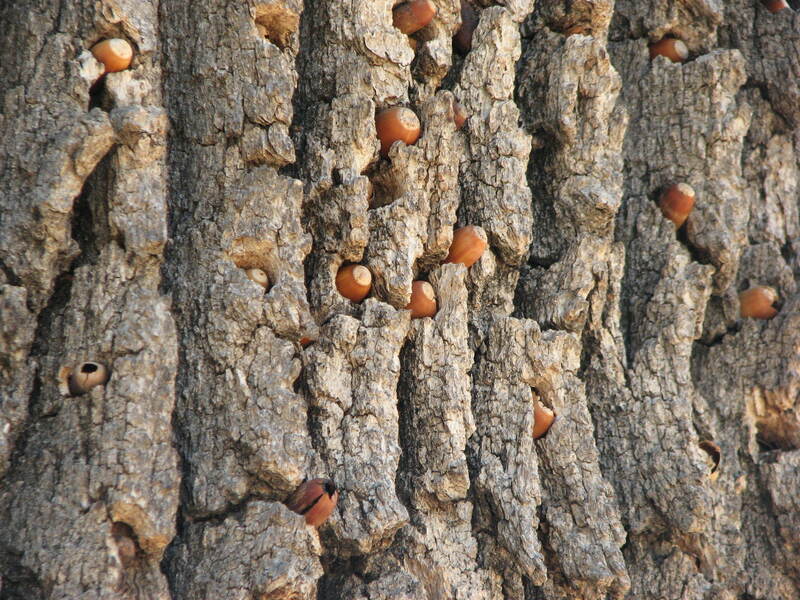 Tracking the bird to a tree, I saw it stash an acorn in a tiny acorn-sized hole. I walked around the tree looking it up and down. The whole tree was a pantry full of carefully stored food. 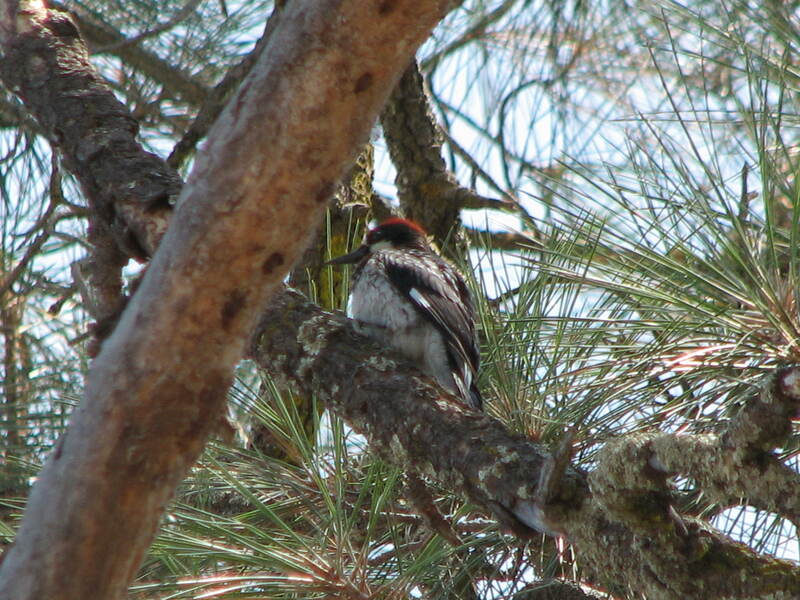 Acorn Woodpeckers do the darnest thing. I have seen them in both California and Arizona. 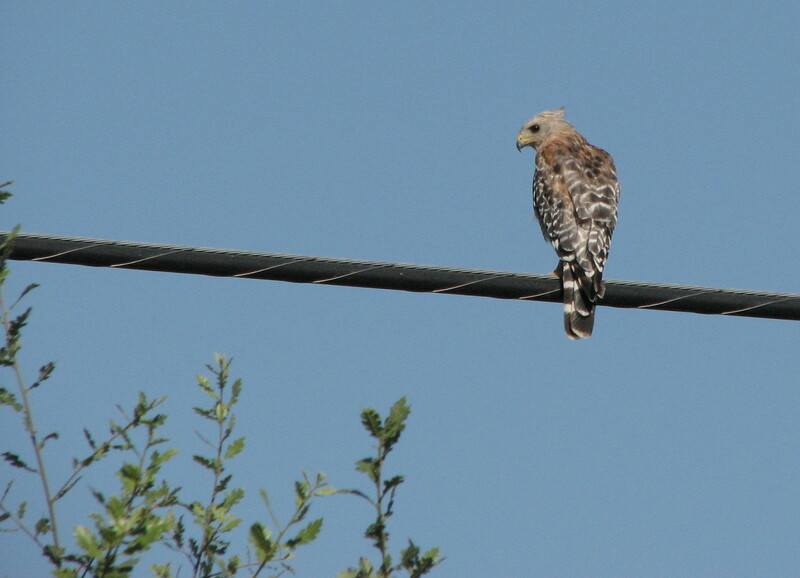 They are easy to see not only in trees but also drilling in telephone poles along the highway. I love that. My favorite woodpecker actually is the Pileated. What’s yours? What the? I slammed on the brakes and swerved onto the shoulder of the road. 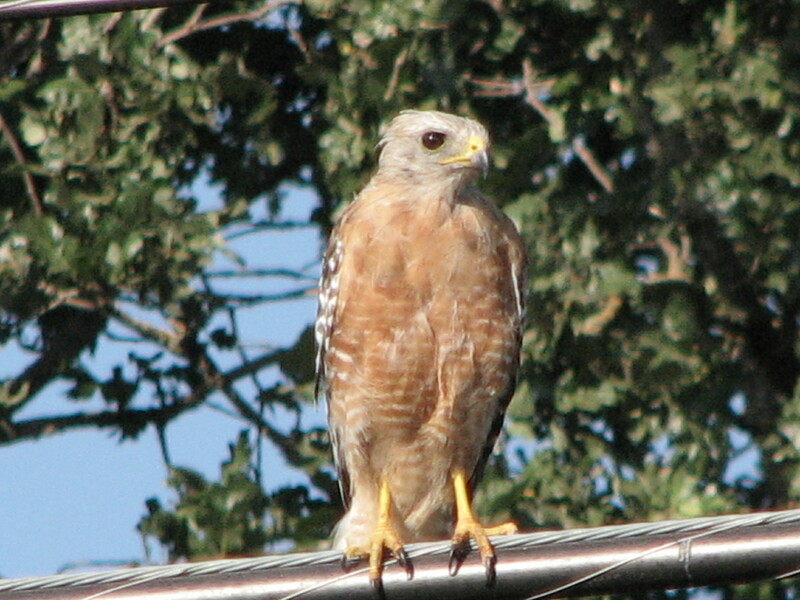 I had seen the oddest hawk on a wire. It had a huge eye and gray head. We watched it as it watched us. We couldn’t figure it out. Big eye, no huge eye, gray head, look at the crest blowing in the breeze, very mottled back, very long legs and was that 3 bands on the tail? Being on the west coast and out of my element, I wasn’t sure. It could be anything. I flipped open my ancient travel Petersen’s. It didn’t fit any of the descriptions. I looked back. It had turned around. With the red chest it had to be a Red-shouldered Hawk. I have never seen one with a gray head before. The Red-shouldered Hawks at home, do not perch on wires, are more woodsy and I usually see and hear them flying high above the trees. He certainly had us going for a while.